January 28, 2014 Culture » Big Shiny Robot! I recently watched the 1981 fantasy classic Dragonslayer for the first time. It was certainly a product of its time: charming, barely sophisticated, and the special effects were the cutting edge from a bygone era. Disney released it, and Phil Tippett—the genius behind the go-motion special effects in the Star Wars films—brought a dragon to life onscreen in a way no one had ever seen. The dragon, Vermithrax Perjorative, terrorized a kingdom that sacrificed virgins to it—via a Hunger Games-like lottery—and the villagers sought the help of a sorcerer and his apprentice to end the dragon’s reign. The concept of the film was simple, its execution clean and easy to understand. Though it didn’t do that well at the box office, it found a cult status on the new (at the time) home-video platform. Audiences and film studios alike saw something there, and they knew they could do something with the genre. Along with other 1981 releases like Clash of the Titans, Excalibur and Time Bandits, Dragonslayer seemed to help kick off a brief golden age of fantasy films. The next year brought us Conan the Barbarian, The Beastmaster, The Dark Crystal and The Sword and the Sorcerer. Dozens of fantasy movies came out over the next few years, reaching a fever pitch by 1985—movies like Ladyhawke, Legend, Red Sonja, Krull and more Conan. Even Disney’s animation department got into the game, giving us the uneven yet still underappreciated The Black Cauldron. Then, the films of that genre burned out—and they wouldn’t return to prominence again until Peter Jackson’s Lord of the Rings saga. After watching Dragonslayer, I started yearning for more sword & sorcery movies. It’s nothing short of stunning to see what can be done in the genre today. 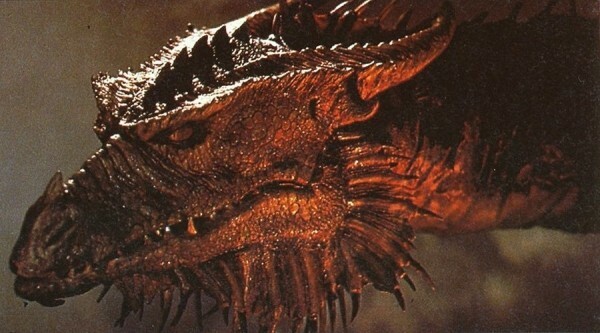 Comparing Vermithrax with Smaug in The Hobbit: The Desolation of Smaug, it’s incredible what 30-plus years can do to reinvigorate a cinematic genre. The technology and the sophistication of storytelling have come a long way; so too have the sensibilities of genre audiences changed. Watching those two cinema dragons, separated by three decades, got me thinking. What about the fantasy movies we call “superhero films”? We’re in a golden age of them now. Will they fizzle after a few more years, like the heyday of 1980s sword & sorcery films? Or will superheroes continue to move forward without missing a beat—or even a year—on the big screen? Or will we think of contemporary films, “How one-dimensional”? You know, since films will be far more interactive in the future. Holo-decks and things of that nature will be everywhere by then, right?